ResponseTap might be the UK’s market leader in Call Intelligence, but that doesn’t mean they’re resting on their laurels. Quite the opposite. Their brief to us was simple “how do you get busy agency account handlers to recommend yet another martech supplier to their clients? We figured agency people would be quick to spot a tool that could give them an obvious competitive advantage. Nevertheless we recognised that we were basically asking them to do us a favour. So we decided to reframe our request as an opportunity and appeal to their self-interest. 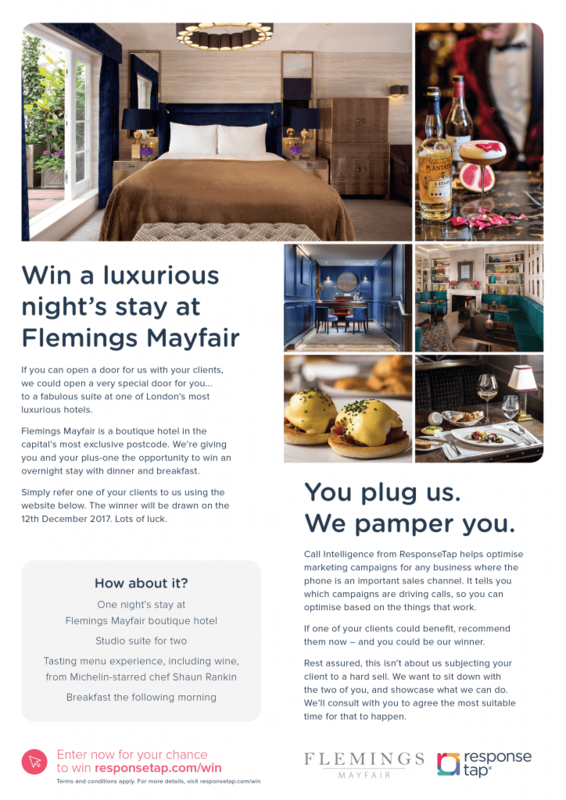 We devised a competition, with a prize that had real desirability – a luxurious stay for two at one of Mayfair’s finest boutique hotels. Something you might not buy for yourself, but if someone treated you to it, you’d be pretty chuffed. We used direct mail to bring the proposition to life. Our pack contained a die-cut ‘do not disturb’ door hanger, a hotel room key-card and a simple lead message: open a door for us and we could open a very special door for you. Supporting copy offered compelling reasons why the recipient should consider recommending Call Intelligence to their clients. But we didn’t just state the product benefits. Again, we appealed to the reader’s self-interest, by including a ‘killer command’ to ‘make yourself a hero’. To ensure a high open rate, and overcome inertia, we teased the pack’s arrival, and sent three follow-ups using email. We also created a simple landing page to optimise campaign conversion. The results for this campaign were outstanding. We were mailing people cold and asking them to do something pretty high-risk: recommend a company you’ve probably never heard of, to one of your clients. We contacted 1,500 agency account handlers via direct mail and email. From this activity we generated 97 inbound referrals. That’s 6.46% response rate in cold B2B direct mail – and a great number of warm new leads. But the good news didn’t stop there. Of the inbound referrals generated, 32 went on to become ResponseTap clients! The fact we achieved the results we did is testament to Red C’s application of strategic nous and strong creativity. We turned a big ask into a tantalising opportunity, by appealing to what we know would motivate people.